$25,000 is a drop in the hat for a school possessing the riches of USC, so it’s not the amount of the fine that hurts the program, as much as it is the infraction itself. Southern California has spent the past three years trying to shed itself of a bad image. And with each incident, no matter how minor, it takes a huge step back. Reverse was the new direction this week, which allowed that eight-letter word to close the distance and rear its ugly head once again—-Cheaters. The Trojan staff announced that a student manager had been fired on Wednesday for deflating footballs on the sideline during last weekend’s game. The balls in question were used by USC’s offensive unit, and the act is a violation of NCAA rules, as it serves a competitive edge to a quarterbacks and receivers. The student manager confirmed that he had, without the knowledge of, or instruction from, any USC student-athlete, coach, staff member or administrator, deflated those game balls after they had been tested and approved by officials prior to the game. The story unraveled when the manager was caught in the act on the Oregon sideline. The Ducks brought it to the attention of the officials, and by Thursday USC was donating a generous sum to charity. Although the official statement from USC claims the offender acted alone, the media would veer towards a different target, and fire shots at Lane Kiffin. Schwab is correct, in part, because a person would not purposely deflate footballs for his team unless he knew someone preferred them that way. But it also doesn’t mean he was commanded by anyone to do it, and may have done it independently, just based on known likes. Had this situation occurred at any other school, and under any other coach, it may have blown over in just 24 hours. But it didn’t happen anywhere else, so it hovers over USC. It adds another item to the list of distractions during Kiffin’s tenure, after Pat Haden stated that he wanted his coach to be unseen and unheard. 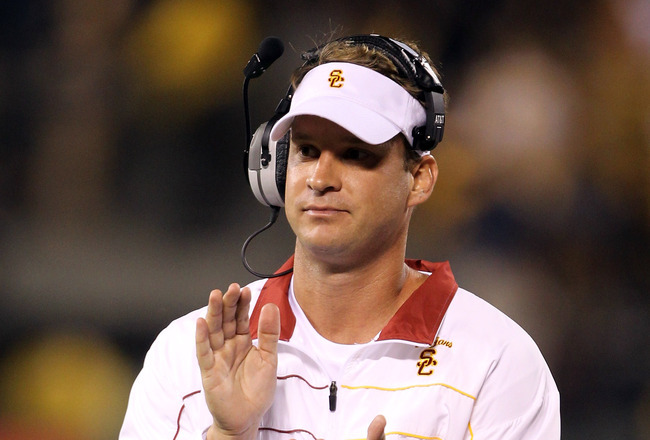 Before Kiffin was settled into his new coaches office, he and Ed Orgeron were accused of contacting Tennessee recruits in an attempt to flip their commitments to USC. Markeith Ambles did the west coast swing, changing his pledge to follow the coach that recruited him, and he is no longer with the program. In his first year, Kiffin and USC made national headlines, because of Dillon Baxter’s golf cart ride across campus with a person known to be an agent. Baxter would also leave the program a year later. Defensive Backs Coach Willie Mack Garza abruptly resigns his post just weeks before the 2011 opener. It was speculated that he abandoned his position because of a past relationship with Willie Lyles, and another distraction arose. 2012 was met with a lie exposed, after it was proven that Southern California’s head coach voted his team No. 1 in the Coaches’ poll, after claiming he did not. By November, the balls are deflated, as the Trojans find no relief from the press. USC was placed under a microscope, after the infractions committed by Reggie Bush. It then hired a spotlighted coach in ‘bad boy’ Lane Kiffin. With the two elements combined, the light shines brighter than ever, and hotter than all college programs. When there’s no escape, you deal with it, moving forward before the next nitpicker arrives. USC has an important game with Arizona State this weekend, and the focus should be on restoring deflated egos, and not deflated balls. ~ by Anthony on November 9, 2012. Who’s to say that the kid wasn’t given enough money to continue his college deucation away from USC by Phil Knight or Chip Kelly for doing this? The kid’s reputation is burned now at USC. After all, it occured on the Oregon sideline. Common sense stipulates that if you’re going to cheat, you don’t do it right in front of your opponent where they can see you.